BEANO PREVENTS GAS. 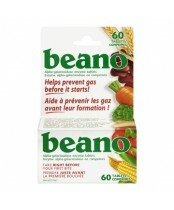 Unlike other gas medicines, Beano contains a natural enzyme that can help prevent gas before it starts. Available in a convenient tablet or meltaway, Beano helps you digest the complex carbohydrates in many of your favorite healthy foods - not just beans. With Beano, you can comfortably enjoy nutritious foods that are an essential part of a healthy diet.